Have you lately heard people saying “don’t try, just do it”? It applies to Christian living too. So often we say “I’ll try to read the Bible and take time to be with God” but then off we go and don’t do anything to make it happen. But that’s not how it works. Saying that we’ll try is not enough. We might fool others but God sees right into our heart. Richard Sibbes has said “Empty relationships are nothing; if we profess ourselves God’s servants and do not honour Him by our obedience, we take but an empty title.” An empty title is not what we want, right? What should we do then? 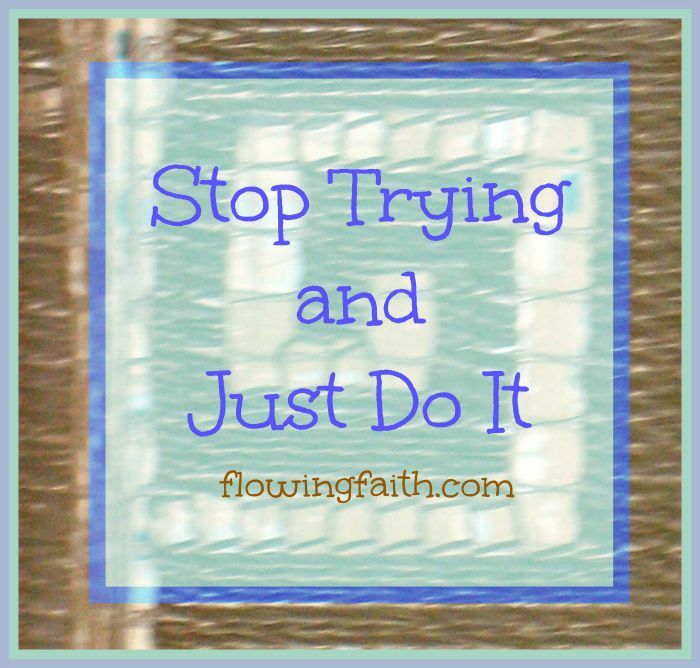 In short: Stop trying and just do it! So stop trying and just do it. Stop trying being spiritual, start doing things God’s way. He will empower you to do so if you just want it and ask for it. Stop pretending and face the facts. No more excuses or empty promises. Either you do put God first or you don’t. Which is it? Thanks for pointing out the facts for us. and act like it too. Empower us to put you always first. draw us to your presence day by day. Q4U: Have you been able to stop trying and do it instead? How did you do it? Be blessed, my fellow pilgrim, as you obediently live out your faith day by day! Image courtesy of creationswap.com, design Mari-Anna Stålnacke. Linking up today with Dance with Jesus, Faith-filled Fridays, Five Minute Friday, and Faith Barista.